Up to 20,000 dogs were trained for front-line duties during World War One, newly uncovered records have shown. The canines carried aid to the wounded, took messages between the lines and sniffed out enemy soldiers. Their roles were deemed so important that in the early months of 1917 the War Office formed the War Dog School of Instruction in Hampshire to train them. They were also used for pulling machine guns and equipment. A collection of old newspapers, which has been made available on the family history website findmypast.co.uk, reveals how the animals lived in the trenches. Many, about 7,000, had been family pets, while others were recruited from dogs' homes or came from police forces. Sentinel dogs were trained to stand quietly on the top of the trench alongside their master's gun barrel, in order to let the soldiers know if anyone attempted to approach the barbed wire. One report, from the Dundee Evening Telegraph in 1916, describes the skills: "A watchdog never barks; at the most he will use a low growl to indicate the presence or approach of a hostile force. "More often than not the mere pricking of the ears or the attitude of expectancy is sufficient to put his master on his guard." 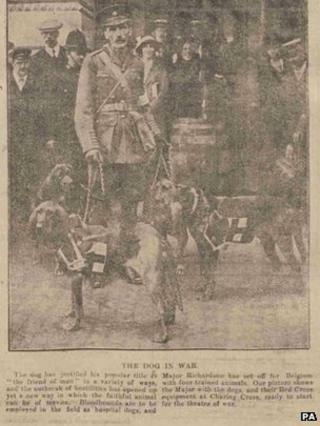 A Lt Col Richardson, the man in charge of running the War Dog School of Instruction, was quoted in the the Aberdeen Evening Express in 1918 as saying: "The skill, courage and tenacity of these dogs has been amazing. "During heavy barrages, when all other communications have been cut, the messenger dogs have made their way, and in many cases have brought messages of vital importance." Debra Chatfield, historian at findmypast.co.uk, said: "It's amazing, and heart wrenching to think of thousands of families saying goodbye to their pet dogs so that they could serve their country at the front line. "Throughout human history, the bond between man and dogs has been unbreakable, and the role these animals played during the war was of paramount importance."